2017 marked another year of growth and innovation for Call2Recycle. Safety remained a cornerstone with the launch of our Charge Up Safety™ campaign, inclusive of educational and outreach battery safety strategies. New recycling options generated an increase in primary battery collections by more than 20 percent and the program experienced growth in light of the introduction of a fee-based all battery offering. With the spinoff of Canada as its own legal entity as of January 1, 2017, this marks the first U.S. only annual report. In 2017, Call2Recycle diverted and recycled 8 million pounds of single-use and rechargeable batteries. These outcomes are due to the dedication of our partners – municipalities, stewards and national retailers – who drive consumer engagement in battery recycling. 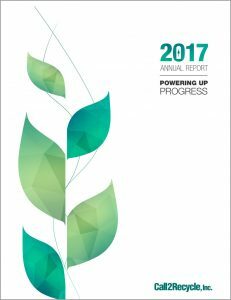 We invite you to read the U.S. 2017 annual report, which overviews these milestones and more.